Last night we continued our spree of eating at Michelin starred restaurants in their lounge area. As I've said previously, I'm a big fan of this style of dining, as it allows me to eat delicious food in more casual settings, without making reservations. The experience can vary quite a bit, and I never know what to expect. For example, some allow you to order off the main menu, some restrict you to a subset of the menu, others have you order only off the completely different lounge menu. Some include all of the extras like amuse bouches, bread service, palette cleaners, petit fours. Some give great service and have waiters, others have the bartenders hastily bringing your food as they try to keep up with the drink orders. Anyway. We went to Quince for 2 main reasons: The first is that I absolutely love desserts, and their pastry chef just won an award and I'd read a lot of great things about him (he was previously at The French Laundry and Per Se), so I was really excited to try his desserts (not that the executive chef is any slouch, he is a James Beard winner). 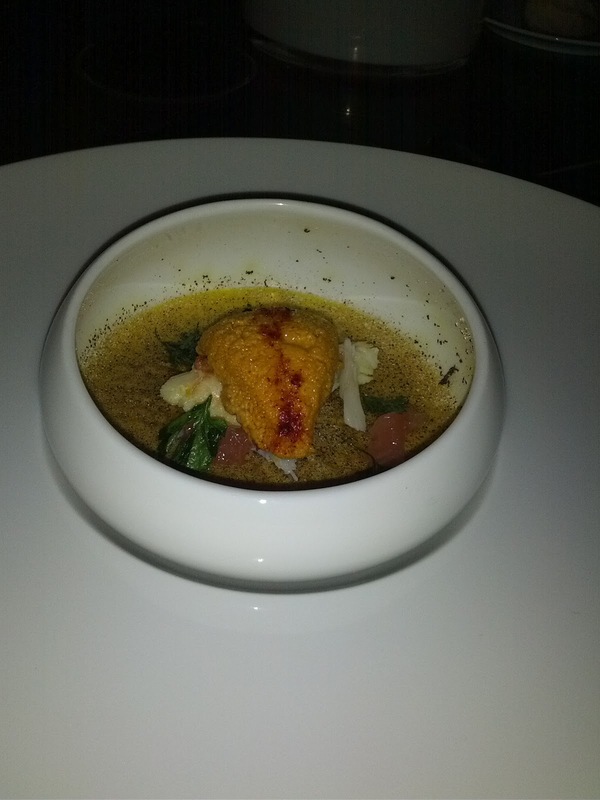 The second is that both the lounge and main menus had an absolutely fascinating dish listed on them: uni creme brulee with dungeness crab. If you've been following my posts, you know that I love uni, I love crab, and I love creme brulee. Once I saw this, it wasn't an option to not get to Quince ASAP to try this out! The plan was to order a few things off the lounge menu (the creme brulee and a few light crudos) and hopefully an item or two from the main menu such as the desserts. However, they would not let us mix and match from the menus. We could each order a full 4 course menu ($95), the 11 course tasting menu ($140), or just items off the lounge menu. This foiled my plans! I had eaten a very large snack at 4pm since I was planning on this being a small meal, so the 11 course or 4 course seemed impossible, but I really wanted to try dessert. Luckily, probably because we were in the more casual bar area rather than the main restaurant, they allowed us to order just two 4 course meals for three of us. In the end, this was still a ton of food, as they brought us the wrong dish for one of the courses so we wound up with 3 pasta courses instead of 2, and they brought us an extra dessert course, and the meal started with a not one but three amuse bouches, multiple types of bread, and finished with a tower of mignardise per person. ZOMG. (Strangely, we didn't receive a palette cleanser, not sure if that was oversight or if they just don't do it). This was a very good meal, one of the best I've had this year. Service was impressively smooth and just felt right - never intrusive but always getting everything done. The courses were well paced. We received our trio of amuse bouches very soon after ordering, quickly followed by bread service. There was a pause between courses, just long enough for us to have a conversation, and then be ready for more. Water glasses were refilled whenever they reached low levels, but never so often that it felt intrusive. Bread service was unlimited. The staff was happy to explain all of the components of a dish, or leave us alone if we were mid-conversation when they came over. We did have one mix-up on a dish, and they brought us the correct dish very quickly, and handled it seamlessly. The bar and lounge was very comfortable, with bar seating and several tables. The execution of the food was near perfection. All of the pasta was amazingly fresh and perfectly al dente. The fried items had the right amount of breading on them to provide a great crispness without being heavy, and didn't feel oily at all. 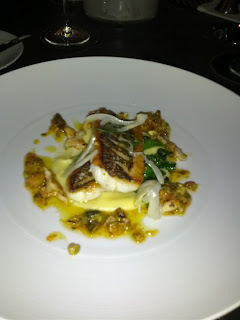 The seafood was all cooked phenomenally, from the crispy skin on the sea bass to the tender softness of the scallops. Ingredients were all high quality. While there wasn't any dish that seriously wowed me and that I'd say you need to go there for, the quality level and consistency of the execution were very high, leading to a pretty fantastic overall meal. Plating was beautiful and while the dishes did contain a lot of things like foams, edible flowers, and gold leaf, it somehow still felt comfortable and somewhat rustic. Or maybe I've just been eating at too many fancy places lately that this seems normal to me. The desserts were surprisingly the weakest part of the meal, really nothing standout at all. My dining companions also had a large parade of drinks, ranging from cocktails, to wine, to brandy older than we all were. They seemed to quite enjoy the selection and quality of drinks. I'll definitely go back, perhaps when the menu has less citrus and fennel on it. I'm also excited to visit their more casual sister restaurant, Cotogna (same executive and pastry chef, but completely different menus, and a la carte. They have a bunch of amazing sounding pasta dishes, better sounding desserts, and even an uni pizza!). 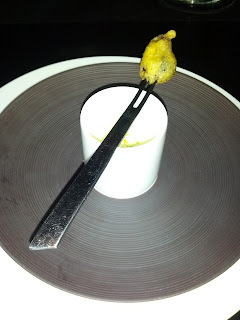 Amuse bouche #1: Fried mussel, shot of creamy saffron and fennel soup. Our parade of amuse bouches began here. We were told to dip the mussel into creamy soup in the shot glass. The mussel was nicely fried, the batter was crisp and not overpowering. This felt a little heavy for an amuse, but it certainly woke up my interest into what the rest of the meal would be like! 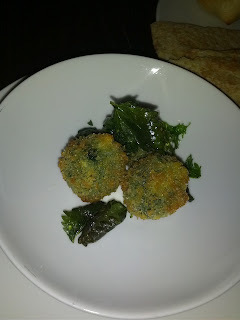 Amuse bouche #2: Fried wild nettle fritelli with mint. Another fairly heavy feeling amuse. Again, nicely fried, with batter that wasn't too heavy and was perfectly crisp. The fried mint leaves alongside were also nice. I didn't really care for the flavor or texture inside of the ball though, it was vaguely cheesy but I'm not sure what else was in there. Amuse bouche #3: Radish with bagna càuda. Final amuse. This one was refreshing and really did cleanse and prepare my palette! 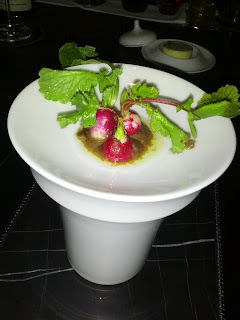 This sounds strange, but it was really satisfying crunching into this incredibly flavorful radish. 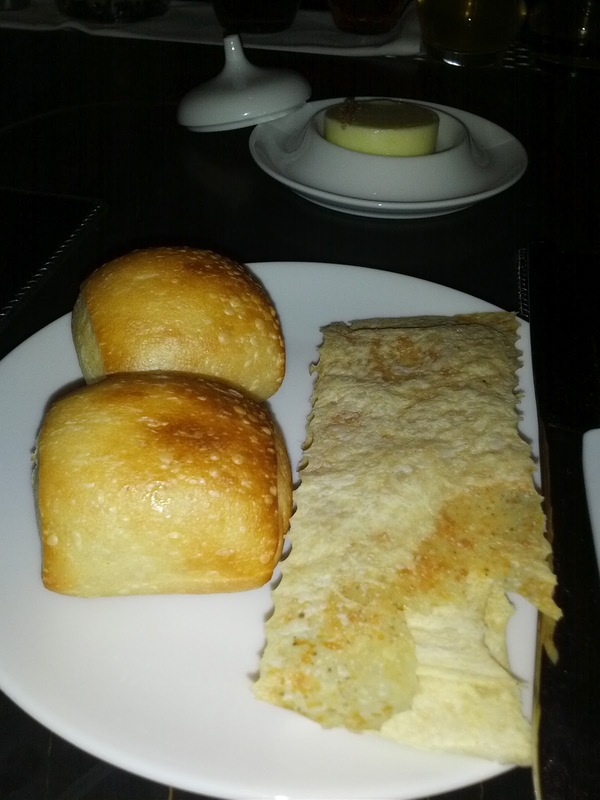 Petite sweet baguette, cheesy cracked pepper crackers, butter with fancy fleur de sel. Surprisingly good bread! I try not to fill up on bread before a 4 course meal, but this was really good (and I was so happy it wasn't sourdough!). The rolls were a petite sweet baguette, with a nice chew on the crust but amazingly soft inside. The crackers were incredibly flavorful with pepper and cheese, nice and crisp. The butter was standard, except that it had a smoky fleur de sel on top that added a great flavor. Nantucket bay scallops, with caviar and cauliﬂower in Pierre Moncuit champagne sauce and foam. Dish of the evening for me! Everything about this dish was pretty much perfect and combined together really well, both flavorwise and texturewise. Plus, it was beautiful! The scallops were so sweet and flavorful. I usually prefer larger scallops and I love them seared with a nice crust on the outside and slightly rare on the inside. However, these got my out of my rut. So tender. Delicious! 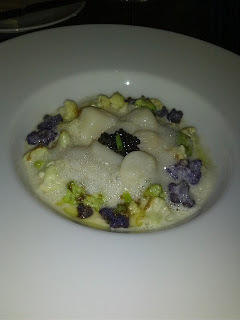 The cauliflower was slightly al dente, providing a delightful crunch and freshness to the dish. I loved the different colors as they made this quite beautiful. The sauce was absolutely delicious. It almost made me want to fill up on more bread by dipping it in the leftover sauce! This was the dish on the menu that inspired us to visit, as I love uni, crab, and creme brulee :) It was certainly the most interesting dish of the evening. And it really was sea urchin creme brulee! The custard layer was intensely uni flavored. I'm not sure how they infused so much uni flavor into it. It was lightly caramelized on top, not nearly as much as a traditional creme brulee, but enough to know it had happened. The crab was a nice generous chunk, but was pretty forgettable, not particularly sweet and it actually didn't really add much to the dish. I somewhat wished that it had been shredded and integrated into the custard instead. 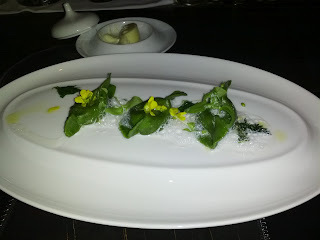 “Casoncelli Verdi”: Barinaga ranch Basseri cheese and winter greens with Capezzana olive oil, edible flowers, foam. We accidentally received this dish, the vegetarian offering of the night. It was my least favorite dish of the evening, not bad, but not noteworthy. The pasta was clearly fresh and housemade, cooked to a perfect al dente level with a nice chew to it. The filling however wasn't very flavorful, with neither the greens nor the cheese really coming through. But, another pretty dish, it looked like spring! “Trofie Della Casa”: “frutti di mare,” wild nettle and pianogrillo particella 34 olive oil. My third favorite dish of the evening. The pasta was again very fresh tasting, clearly homemade, cooked perfectly al dente. Tossed with the pasta was crab meat and a very fancy olive oil. I'm not an olive oil connoisseur (yet) so the name didn't mean anything to me, but it was very flavorful. The crab in this dish had much more flavor than in the creme brulee, probably due to the oil. Alongside was some mussels, more scallops, wild nettles. These scallops were fine, nicely cooked and tender, but not as amazing as the ones in the cauliflower dish, probably due to the sauce in that dish being so incredible. 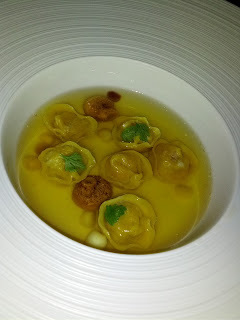 “Tortellini en Brodo”: veal sweetbread, turnip, mushroom, Vin Santo Del chianti and foie gras. My second favorite dish of the evening. The filling of these tortellini was absolutely incredible. The experience of bitting into one of them was fantastic, flavors just burst out of the tortellini into your mouth! Rich from the foie gras and sweetbreads, balanced by the again perfectly al dente and fresh tasting pasta. The broth was actually a letdown ... not particularly flavor, just salty and there. I had no interest in really drinking it. Black sea bass, geoduck, pistachio, puntarelle and fennel. The execution on this fish was amazing. The skin side was amazingly crispy. I usually don't care for skin on my fish, but this was delicious. And did I mention perfectly crispy? The fish itself was flaky, tender, and buttery. However, the best part of the dish was the geoduck! This was my first time having geoduck. And I loved it! It seems like something that can easily go the way of calamari/abalone/scallops/etc though, where if not cooked perfectly it would be rubbery and not enjoyable. Luckily for us, Quince really knows how to execute its cooking. 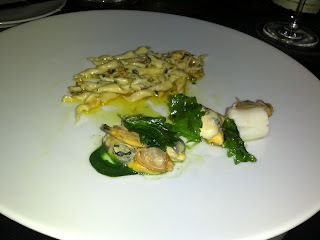 I loved the texture of the geoduck, the strong flavor, everything about it. My second favorite bites of the night (behind the scallops). The rest of the dish didn't really come together for me. The pistachio was somewhat soggy and off putting. The fennel and puntarelle were just kinda there. There was also some sort of puree under the fish, I'm not sure what it was and a sauce that again I couldn't quite identify. The citrus on this dish absolutely did not pair well with it. I think it was grapefruit or something else very sour and it really did not go with the fish at all. Overall this dish failed, but the fish really was cooked amazingly. Mandarin Creamsicle: hazelnut streusel, vanilla bean semifreddo, toasted brioche coulis, mandarin sorbet, blood orange, grapefruit segments. This was pretty forgettable, but perhaps I'm just sick of citrus. The sorbet was tangy, but meh, it was just mandarin sorbet. 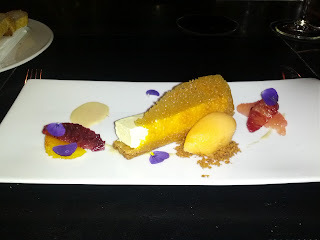 The semifreddo wasn't particularly flavorful, the citrus segments were just citrus segments. Meh. Toasted Marshmallow: warm chocolate ganache, chocolate cake, chocolate crisp, almond and caramel ice cream, graham cracker crumble, gold leaf. Bonus dessert! Our waiter decided to bring us this as well. 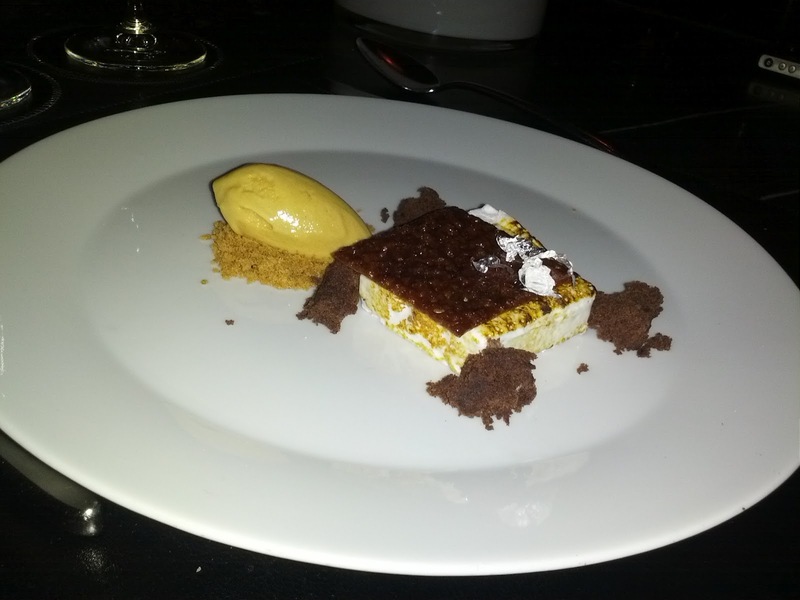 I loved the concept of this dish, sort of a deconstructed s'more. And it contained many components that I really like - chocolate cake! chocolate ganache! ice cream! toasted marshmallow! But ... it didn't really do it for me. The biggest issue was the ratios of the components. Too much marshmallow, resulting in a pure sugary sweetness that was not balanced nor complex. And I love marshmallows, particularly when fresh out of a campfire, so gooey and delicious. Perhaps a smaller marshmallow, or one that was less sweet, would work better. The chocolate cake bits were forgettable, nothing wrong with them, but nothing interesting. The chocolate crisp on top was also pretty forgettable. The warm chocolate ganache was pretty tasty and helped cut the sweetness of the marshmallow, and it was easy to make a good bite composed of the soft ganache and a chunk of marshmallow (you can't see it in the photo, but it was basically a little pile of fairly liquid chocolate hiding in back). The caramel ice cream and crumble were tasty, but combining bites of ice cream and marshmallow were strange, the textures and flavors didn't quite work for me. Breads and crackers for the cheese platter. Pretty forgettable breads. 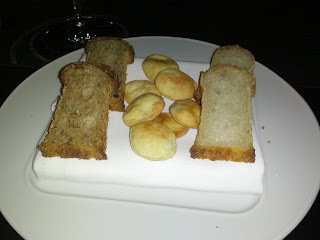 They were cute, but were not nearly as good as the starter breads. The amazing part of these cheese platter was what lead to it. This was not just a "I'll have the cheese platter". 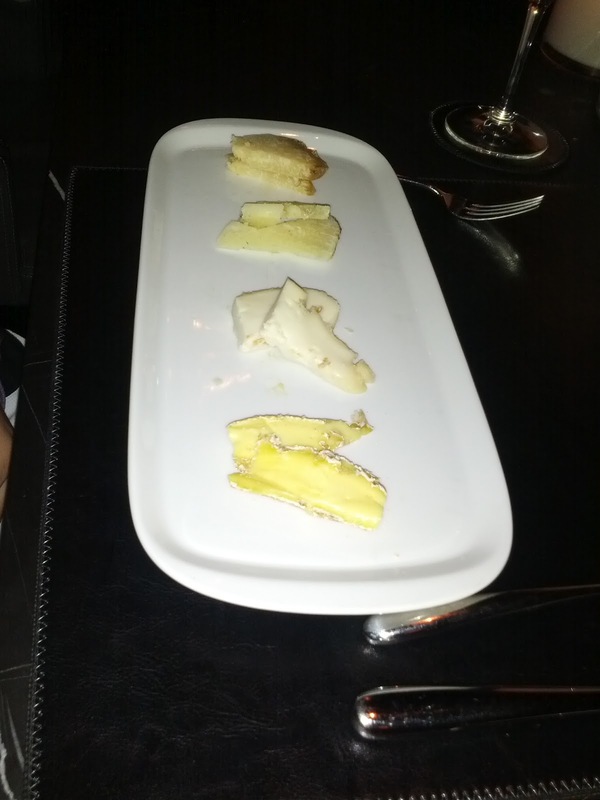 Emil ordered the cheese platter, and then was basically interviewed about his cheese preferences. The waiter (who at this point I'd call a cheese sommelier) asked all sorts of questions to refine his understanding of the types of cheeses Emil enjoyed. It was a fascinating conversation to witness and really reminded me of someone talking to a wine sommelier, talking about different growing regions, how long things had been aged, etc. I only tried the super creamy cheese closest to the front of the tray (and it was good, creamy with a nutty flavor), my dining companion can tell you more about these. Mignardises: Chocolate ginger tart with gold leaf, sable cookie, salted caramel truffles, blood orange pate de fruit, praline macaroon. What do you need after dessert? More dessert! Each diner receives a tower full of mignardises at the end of the meal. These were all cute, but didn't particularly wow me. The chocolate ginger tart was adorable, with a thin tart layer, a chocolate ginger ganache, and topped with the tiniest little piece of gold leaf. But, the tart shell wasn't that great, and the chocolate and ginger were pretty meh. The sable was just a plain little shortbread, nothing really to say about it. Crisp, meh. The blood orange pate de fruit had a fairly intest tang from the citrus and was a nice texture. 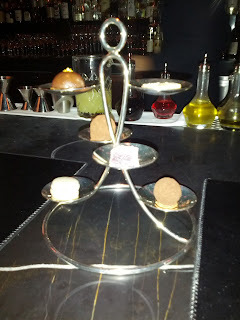 The truffles were probably my favorite, filled with a nice salty caramel ganache. I could have done without all the cocoa powder though. The macaroon was decent, a good almond flavor and texture on the cookie, the filling flavorful and not too sweet. The cookie was particularly impressive due to its tiny size, it seems hard to get it to be baked properly. My weekly tasting this week had a fun theme: Upscale movie theatre chocolates! To start off, we were given a classic Whopper and then a Recchiuti dark chocolate covered malt ball to compare. While I didn't love any of the movie theatre confections, this was a fun theme! Summary of the week's chocolates: I think I just don't like Recchiuti chocolates very much. And I found a new line of toffee I want to explore (Poco Dolce). Dark chocolate covered raspberry jelly beans: Tasting notes: Sort of like a more sophisticated version of chocogummies. But, these don’t really work. Dark chocolate isn’t very good and overwhelms the jelly bean flavor. Dark chocolate caramel: dark chocolate shell around caramel filling. Tasting notes: Chocolate has nice snap when bite into it, shiny, decent. Caramel was ok, nothing spectacular. White chocolate filled with boozy ganache. Tasting notes: white chocolate shell around some sort of boozy filling. Very boozy, but just sweet and gross. Milk chocolate caramel square: Milk chocolate around gooey caramel center. Tasting notes: pretty mediocre milk chocolate, caramel filling way too sweet and not complex. Malted Revolution: Malt center covered in dark milk chocolate with fluer de sel. Tasting notes: The center is much more crisp than a Whooper. Likewise, it doesn’t dissolve on the tongue in the fun way a Whooper does. The center was far more malty than a Whopper though. The dark chocolate is obvoiusly higher quality than the chocolate on a Whooper, but it actually doesn’t work as well. I didn’t pick up on the fluer de sel at all. This piece was lost on me! Peppermint Thin: “organic Willamette Valley peppermint drenched in our custom blend of 64% semisweet chocolate.”. Tasting notes: This was very thin, with about an equal amount of chocolate as filling. As a result, it wasn’t minty enough for me. The majority flavor was the chocolate, with the filling giving a nice creamyness, but not much more. I haven’t had a York peppermint patty in years, so I can’t compare, but I remember them having much more filling and feeling more minty. Popcorn toffee: “Fresh, air-popped popcorn folded into bite-sized pieces of our buttery Toffee and enrobed in bittersweet chocolate.” Tasting notes: Nice caramely hard toffee. I could see that there were bits of something in it, but I wouldn’t have been able to identify them as popcorn. Chocolate coating paired well with the toffee. Subtle butter aftertaste, perhaps that was the popcorn? I’m interested in trying their other toffees! Burnt caramel truffle: “Dark, smoky caramel blended with extra-bitter chocolate ganache. Enrobed in pure bittersweet chocolate.” Tasting notes: this was just another dark chocolate with caramel ganache to me. Nothing stood out in particular - the dark chocolate coating is fine, but not particularly flavorful or bitter. The filling is smooth, but the burnt caramel flavor is pretty subtle, particularly the “burnt” part. Would not purchase. Tasting notes (updated): Again, do not really taste the caramel. Chocolate is nice and smooth. Candy cane almond: almond, layer of chocolate, layer of mint white chocolate. Tasting notes: ok mint flavor, milk chocolate layer totally lost, mostly just sweet, nice crunchy almond but almond flavor covered up by sweet. Chocolat Moderne. Valhrona couverture. From New York, small artisan. 61% cocoa content. Avant-Guard Peanut Pizzazz Bistro Bar: Dark chocolate bar filled with salted peanut and milk chocolate praliné blended with flecks of caramelized sugar. Nice - chocolate decent, peanut praline was really flavorful and nice, ground up peanuts in nice flavors. Tasting notes (updated): The chocolate coating itself was not very flavorful or complex, no bitterness nor creamyness. The inside reminded me of a butterfinger, although more peanuty. I wasn’t a huge fan of this as a chocolate bar, but when I thought of it more like a candy bar (like a butterfinger), it grew on me. Tasting notes(more updated): Now that I know what to expect, I really like this. The dark chocolate is pretty decent on the outside and the peanut filling is a nice caramelized peanuty mix. Really, a high end butterfinger! ginger & nib: 62% dark chocolate, with ginger and nibs. Contains cocoa butter and cane juice. Tasting notes: like their other bars chocolate itself isn’t that great, candied ginger is nice, nib adds a nice. crunch. Tasting notes(updated): flavors very subtle, didn’t pick up on ginger or nib really. Tasting notes (updated more): ginger provides a nice zing, chocolate not that interesting, didn’t pick up on nibs. Whopper. Tasting notes: Not very flavorful malted center, crappy milk chocolate coating, very sweet. I do like how the center melts in your mouth!